The 4 Man Bob coaster was part of the line up in Talbot Street, down the side of the old Talbot Street Theatre. It was installed in 1985 and removed in 1991. 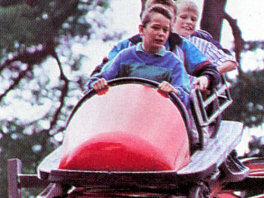 The coaster used a combination of sweeping bends and tight turns to give it an extremely small footprint. This coaster was ideal for the younger visitors who wanted the thrill of a rollercoaster without the limitation of height restrictions.